Our team of professionals will gladly help you to choose and book a nice, beautiful and comfortable villa for your pleasant holidays spending. All you need is to contact us and inform us about the type of villa and the resort you would like to spend your vocations at. Or you can simply send us a request for accommodation choosing and selection. But first of all we will try to demolish two famous myths about the rent of accommodation units in Goa. Let’s take the average villa, for example, the object #2104. This villa has 4 bedrooms which perfectly suit families with children. Choosing this type of private villa you will get the interior of 4* hotel but with some additional pleasant and useful options like kitchen, microwave and washing machine. The stay in such villa costs about $875 for 2 people (1 bedroom) for the period of 10 days. The price also includes breakfast, swimming-pool usage and transfer. The price for staying in, for example, in Holiday Inn 4* Hotel ffor the same 10 nights in Double Suite Room will cost you about $2212 not taking into account the cost of plane tickets (the information was taken from the Tour Operators websites). So, if we compare the cost of accommodation in a good 4* hotel and at villa, we will see that it is much more profitable to rent a private villa (the price for villa renting will 2-3 times lower than the price for the hotel room as we saw from the example shown above). Of course, this variant would perfectly suite the company of 4-8 people. The comparison of the prices was made for January 2012. Yes, it is possible and very easy to do: you will just need to walk along the coastline and you will find lots of different accommodation units on site. 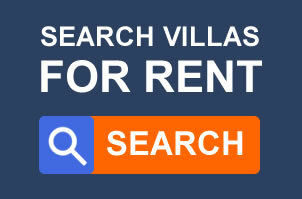 For the successful results of your searches of accommodation for rent you would only need to know English, have a motorbike, be without any baggage and have plenty of spare time for bidding's. And only having these you will be able to find lots of different types of local production houses which sometimes is very difficult to call “accommodation”. It should also be noticed that all good variants and especially variants of residing complexes with swimming-pool, kitchen and other simple essential services, with the 24-hour security and separated territory are usually located in a very quite and secluded places. We wish you to make a right choice.